After Grunt (1) Joe Boonie Rat, Vladi sculpted second figure of the series again inspired by a real time Vietnam War photo. B6-35305 Grunt(2) Eddie “Skull” depicts an U.S. Army Grunt with an unusual war symbol at hand. Figure is served in standard company cardboard box labeled with a photo of the assembled and painted figure. Small parts come inside a small transparent zip-lock bag and this bag is inserted into a bigger bag together with body part. As always, parts are represented on easy to remove casting blocks, but extra care may need on the muzzle of rifle. Resin quality is good and casting is clean. No air bubble or casting mistakes, just a visible vertical seamline to clean on the right side of body. Sculpted in 1/35 scale by Vladimir Demchenko on a standing pose, figure is cast on resin and comes in 7 parts. Body : He wears an OD t-shirt and Tropical jungle trousers with trotters inserted inside his leather-canvas combined Jungle boots. Cloth folds and wrinkles of the uniform, rear and side cargo pockets with flap covers, front fly and belt bridges are all well defined. He has a necklace with a cross on his neck. Head; Facial details and hair are nicely sculpted. He has a Bonnie hat on his head. Arms ; Right arm is posed to carry a walking stick or a war symbol with a skull on top like he feels like a sorcerer. Left arm carries a rifle and a wrist watch is added. 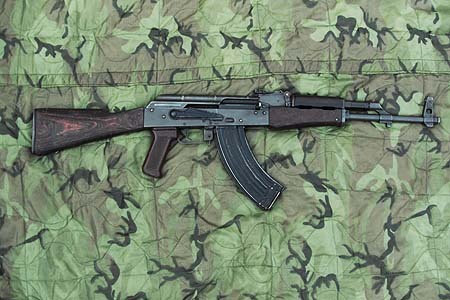 Rifle ; Figure carries an AK-47 or its Chinese version Type 56 commonly used during Vietnam War. It is easily recognized with its high front sights, large selector/safety switch on the right side and the long, curved banana magazine. AK-47 is a gas-operated, magazine-fed rifle which has a semiautomatic fire rate of 40 rounds with an effective range about 400 meters. It is shorter and heavier than the M-16 but with a lower fire rate and muzzle velocity. Details of the rifle are well defined. Left hand is cast on the forestock. Another unique figure sculpted and cast in nice details that can be displayed alone or can be a part of bigger Vietnam War scenes. Verdict: Nice addition to Army Grunts. Rare Nam figure with a skull. While everything about this figurine is good -in a creepy sort of way- I think that the face and how it was painted makes him look more like Little 'bo Peep. Sorry, he looks too goofy to be carrying the Ju-Ju stick.